If you find the trailer tense, wait till you see the movie. This is a film that lived up to my expectations and had a solid emotional wallop to go with it. There are beautiful moments and poignant ones but most of all there are tense interludes that will keep you on the edge of your seat for most of the running time. The 3D IMAX experience was well worth the extra cost because the story is really told from a first hand point of view and you get to experience that point of view in vivid detail with all of the debris and drama flying at you. 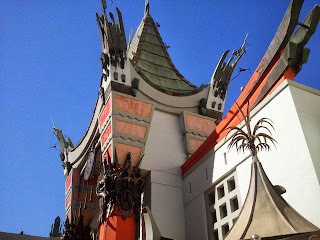 Two weeks ago, the newly refurbished Chinese Theater on Hollywood Blvd. reopened as an IMAX venue. One of my on-line friends took his family to the one week run of the 3D version of the Wizard of Oz. After reading his glorious appreciation of the experience I was frankly envious. I would have loved to do that. 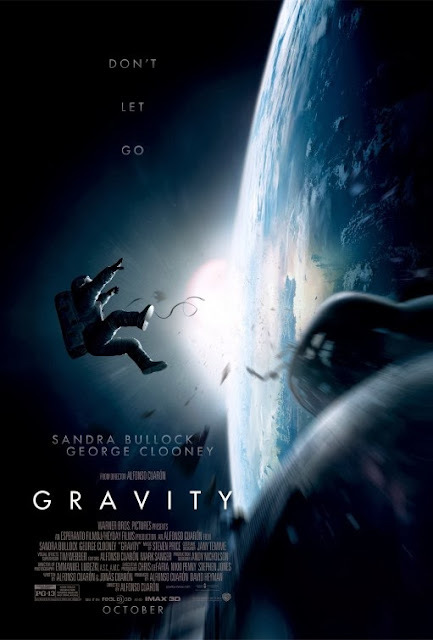 I knew however that "Gravity" was scheduled to be there in the following week and I have been looking forward to this film since the first teaser. George Clooney and Sandra Bullock are the whole show when it comes to actors on screen. They however are not really alone because the magicians who perform special effects magic are right there beside them. This is the most realistic vision of space we are likely to see in a fictional form. The only images that compete with it are the films done by NASA themselves. The camera work is likely to leave you dizzy but not in the way that the shaky cam has over the last ten years. The rotation of the Earth and the difficulty in finding a fixed point in space contribute to a sense of vertigo that makes the story feel more personal. If you are wondering what fills the time in a film about astronauts cut off from their ship, don't fret. There is a very effective survival plot to go along with the events that lead to the tragedy. This is not an hour and a half mediation on man's place in the Universe as their time slowly runs out. The well trained professionals here are going to find every opportunity they can to rescue themselves. Well each of the characters may despair at one point or another, we ultimately have a powerful story of human will to survive presented to us. There are moments of surprise and quick actions accompanied by more slowly building incidents that also bring the kettle to a boil. This is a world where Murphy's Law is clearly in place and nothing can be counted on to be simple. While that seems manipulative in a film like "Armageddon" it is much more natural and easy to accept in this story. Both actors have to do most of their work inside of the pressurized space suits that sustain life for a limited time in space. There is a plethora of digital readouts and space based images that cross the clear face-masks of the astronauts. This adds data but not enough to be distracting or to answer too many questions. There are so many details to take in at any moment that we wonder how it is that these two can keep from being overwhelmed. It is Clooney's clear and calm voice that reminds us that they have been trained and prepared for all sorts of eventualities and that this is the time that their training needs to kick in. His ability to remain focused and even at time make a well placed joke, pulls both characters back from the panic that any one of us would surely go through in the same situation. Sandra Bullock gets the lions share of the accolades however since so much of the stories emotional impact depends on our ability to identify with her. 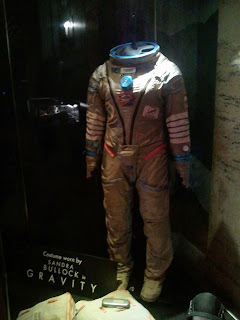 The set up makes it clear that this is her first time in space and as a mission specialist, she has the least amount of training to handle the catastrophe. In most of her quiet moments we can see a frightened woman who is struggling with the question of how to go on in the face of overwintering odds. There is a fantastic effect when her tears float off of her face and into the camera that brings us really close to the character she is playing. I have not seen many female performances this year that would rival the work she does here without resorting to histrionics. I thought it was deeply felt and subtly conveyed. She is a movie star to be sure but she is also a very good actress. 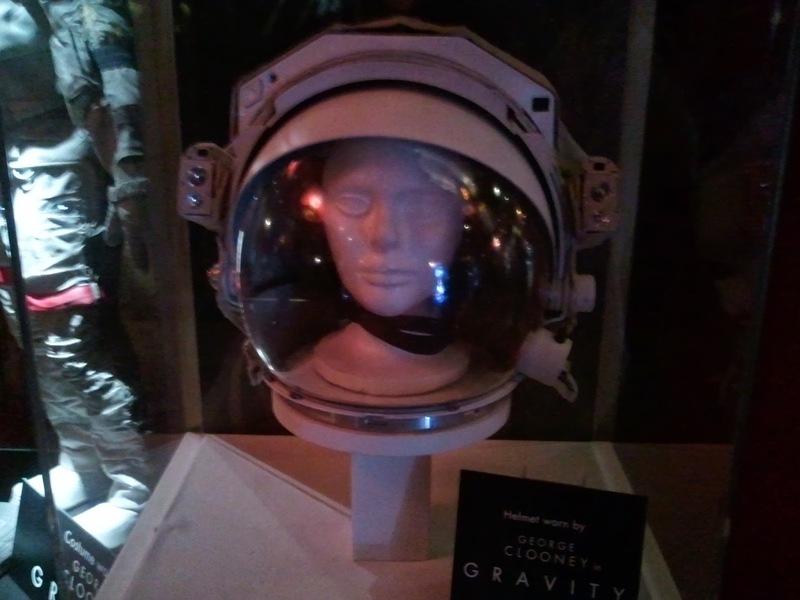 "Gravity" is the most exciting film I have seen this year and it will certainly be a contender for a number of awards in technical fields including directing. Alfonso Cuarón has created a dynamic film that features a terrific lead performance by his female star and all the editing and camerawork should be noted as well. We have a contender here and it is also a very entertaining film. Addendum: It suddenly dawned on me that I have not seen a film in the main house at the Chinese Theater for almost a dozen years. The last film I am certain we saw there was a press screening of "3000 Miles to Graceland" where we met both Kevin Costner and Kevin Pollock. Clearly it has been too long. 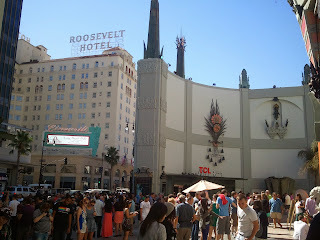 The Outside of the theater continues to be a tourist destination as you can see here. From the outside the theater has not changed at all. The foot and hand prints of the stars still line the courtyard and the crowds bend over to examine them and stand in the same spot that John Wayne or Gregory Peck stood when they were immortalized. The only things missing from the days when I used to haunt this location on a near weekly basis are the ticket booth with awning that has long gone and the giant marquee that announced in huge lettering the feature that is playing in the big theater. 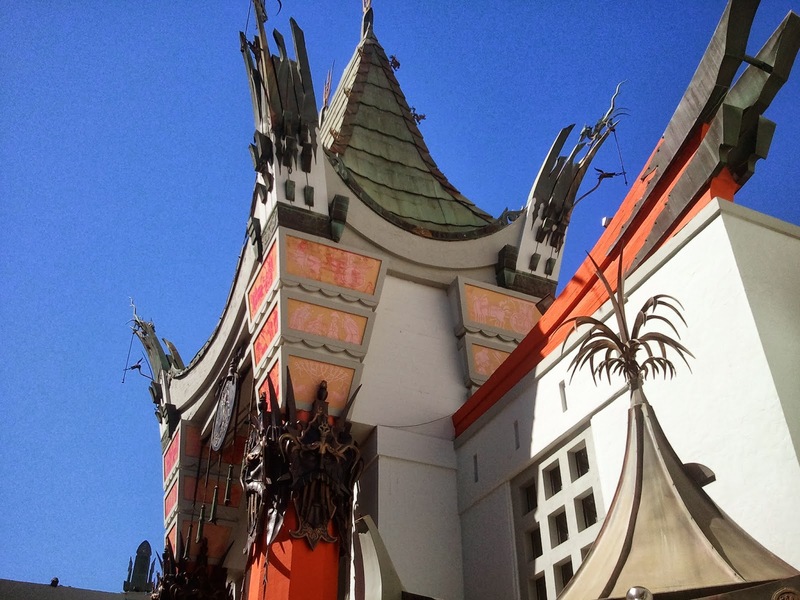 The only marquee now visible is the one at the street box office for the multiplex Chinese Theater located in the same complex. 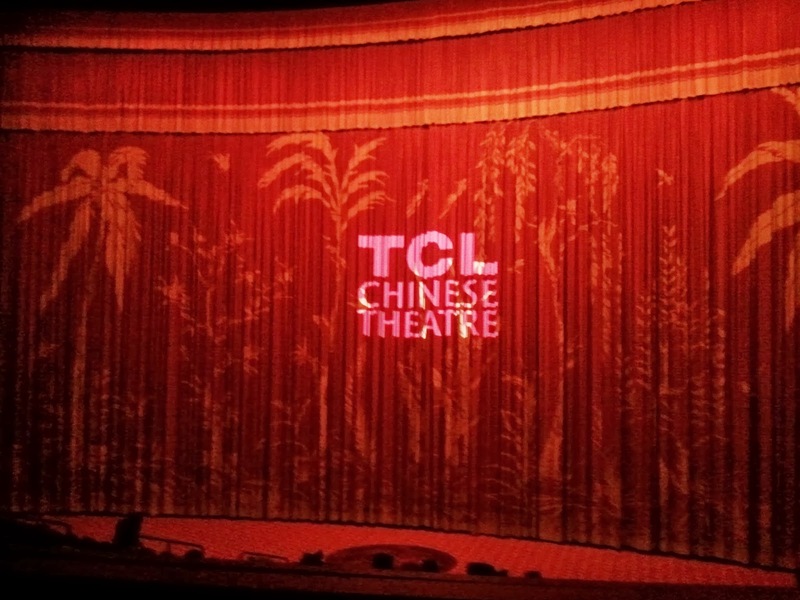 The theater has been taken over by a Chinese conglomerate and they have wisely upgraded the screen and the seating area but left most of the traditional trappings in place. The interior still looks like a Chinese Palace and the original wall hanging appear to have been cleaned up and restored but not changed. The IMAX screen is large but it does not hover above you like those at museum locations around the country. The bathrooms continue to be located inconveniently in the basement, requiring a descent down a narrow flight of stairs. It looks pretty much the way I remembered it so those modifications that took place did not drop down to the lower level of the lobby. The one difference in the lobby area that was clear was the depth of the concession stand area. While not as wide and roomy as many theaters now a days, it is back away from the main doors enough that you no longer have to cross through the lines of patrons waiting for popcorn to get to the main exit or the stairs to the bathroom. Prior to the film today, two trailers ran for films that will be on the big screen here: The Hunger Games:Catching Fire and The Hobbit: The Desolation of Smaug. Each film looked like a winner in the brief shots we got and the 3D IMAX should complement them very well. Yep,I expect it will also be very successful at the box office.It was very satisfying.